Ah, Cygnet. 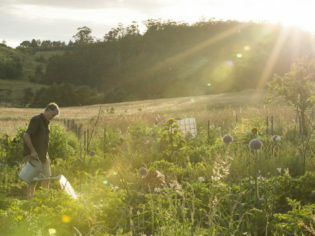 Right amidst a fruit growing nirvana, this Tassie town lies smack bang between both the the beautiful D’Entrecasteaux Channe and the majestic Huon River. Around 50 minutes south of Hobart, Cygnet lies in Tasmania’s Huon Valley. Named in the 18th century by Bruni d’Entrecasteaux for the swans that graced its waters, the pretty town of Cygnet is known for its bountiful produce, in particular apples, cherries and berries, as well as hazelnuts, salmon, cheeses and cool-climate wines. It is home to the SBS series Gourmet Farmer and has become popular for its arts and crafts scene. Writer and producer Posie Graeme-Evans is very fond of Tasmania, having lived here on three separate occasions – the most recent as innkeeper of bespoke accommodation Frenchman’s River in the beautiful hamlet of Cygnet. Together with her former production designer husband Andrew Blaxland, their 80-hectare farm is home to two gorgeous and cosy adults-only retreats that boast views of pastures, the open sky and the serenity of Cygnet Bay. Here Posie shares her perfect day in Cygnet. A favourite place for breakfast is the Conservatory Café in Cygnet Old Bank. Sit outside in the pretty garden beside the stream. The locally sourced and house-prepared food is delicious and Sharon, the owner, is a delight. Say Posie sent you! Saunter next door from the cafe to Three Twigs. Sisters Jackie and Karen will be delighted to show you the homewares, lovely clothes in natural fibres, stylish bags and more. Wander down to Trove, situated in the old Cygnet post office. Curated by owner Talan Atkins, it has an eclectic collection of (mostly) 20th-century furniture, objects, crockery, paintings and antique homewares. Head over the road to Huon Art. Owner/curator Carlene de Très specialises in local art, as well as artists from the mainland. Magnificent canvases by local artists Richard Stanley and Sue Miller can be found hanging beside works by celebrated watercolourist Roger Murphy and northern Tasmanian artist Rachel Howell. Time for a coffee stop at Cygnet’s celebrated vegetarian restaurant, The Red Velvet Lounge. If you’re here on a Friday book ahead for Fat Pig Farm’s Friday Feast. It’s a lovely drive of about 10 minutes up the road to Glaziers Bay. Featuring paddock-to-plate cuisine, all produce is from the farm and prepared in the open kitchen. Between courses you’ll be invited to walk through the gardens, orchards and paddocks with Matthew Evans, the ‘gourmet farmer’ himself, or his partner Sadie Chrestman. Keep an eye out for their cooking classes and other special events, too. Back in town, visit Bec at the Cygnet Garden Larder to pick up some local fruit and veggies, organic milk, eggs, cheeses and other delicious goodies (honey, sweets, preserves). It’s time to retire to your accommodation at Frenchman’s River. Whether you’re staying in the Writer’s House or the Helmsman’s House, you’ll find a bottle of local pinot, rosé or chardonnay to enjoy on the terrace as you watch the sun set over Cygnet Bay. In the paddocks below you’ll see the cows head to the dairy to be milked for the triple cream brie you’re eating from Mt Cygnet Dairy (the pantry is generously stocked for all guests). Local food miles? None that you’d notice.